Dumpsters and rolling refuse containers are subjected to rough treatment and face all weather elements. 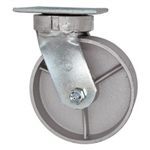 Service Caster has casters with wheels able to withstand both abuse and harsh environments. Our Series #30 is a popular selection for dumpsters fitted with a 6" x 2" wheel. Wheel treads of semi-steel and moldon rubber are our most popular sellers. More options and assistance are available by calling us at 1-800-215-8220. 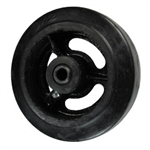 5" Heavy Swivel Casters Polyurethane Tread Metal Core - 1,000 lbs Cap. 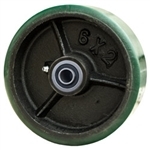 5" Heavy Swivel Casters Polyurethane on Metal Core with Ball Bearings - 1,000 lbs Cap. 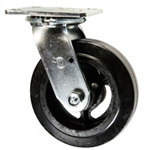 6" Heavy Swivel Caster Polyurethane on Metal Core with Ball Bearings - 1,200 lbs Cap.